user warning: Can't create/write to file '/tmp/#sql_3927_0.MYI' (Errcode: 28) query: SELECT t.*,v.weight AS v_weight_unused FROM term_node r INNER JOIN term_data t ON r.tid = t.tid INNER JOIN vocabulary v ON t.vid = v.vid WHERE r.vid = 413 ORDER BY v.weight, t.weight, t.name in /home/forge/coloradortl.org/modules/taxonomy/taxonomy.module on line 640. Bob Enyart... spokesman for Colorado Right to Life — roundly condemns the killing of abortion doctors and says there is "no justification" for their role in "the long war against God." "You don't love the child by killing it, and you don't love the mother by turning her into an accomplice," Enyart says. "Warren Hern is not motivated by a desire of freedom for the woman and her family. As with the left generally, his is a world view of killing the innocent and protecting the guilty." 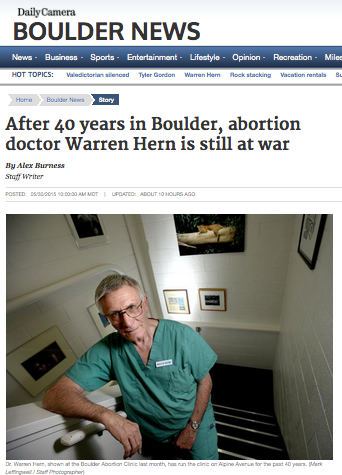 This transcript, first published statewide in the Denver Catholic Register, alerted a hundred thousand families to the truth that abortionist Warren Hern unwittingly admitted: that it is people like him who should decide who should live and who should die. The pro-abortion American Bar Association summarized the case as "the first attempt in the nation to wrest control of a patient's fate out of the family's hands." Oliver Wanglie wanted to continue care for his 87-year old wife Helga, as did their two children and other doctors at the same hospital, yet they were dragged into court by two Minneapolis doctors and the hospital that was trying to get the state to overrule the family. This case illustrates the deception of abortion and euthanasia advocates who claim to believe that these "life and death decisions" are for the family and individuals to make, when in reality, they will urge the state to come down against the family on the side of killing the innocent. * Also in the Daily Camera: Charlie Danaher: Barbarism started long before the body parts.